Celine V. Paradis married (?) Michaud. Celine V. Paradis married Richard M. Houghton, son of Raymond White. Wilfred Ralph Houghton married Dorothy F. (?) in circa 1929 age 28 and 21. 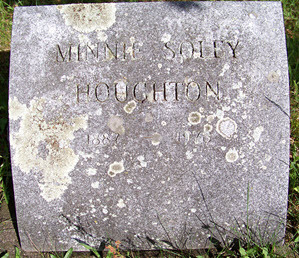 Minnie Soley married Richard Arnold Houghton, son of Charles Clapp Houghton and Harriet Arnold, in circa 1915 age 27 and 26. Harry Houghton married Lois (?) in circa 1927 age 27 and 20. Leroy Parker Houghton married Anna Eddy. Loretta C. Marchand married Chester Arthur Houghton, son of William H. Houghton and Mary J. Harrop, in circa 1922 age 33 and 25. Doris G. (?) married Cecil Elbridge Houghton, son of Daniel Everett Houghton and Izetta Sargent.